Jo Ann Salgado is one of the leading experts in bridal makeup in San Diego and the surrounding area. She has an impressive track record of clients and qualifications. Jo Ann attended a highly acclaimed make-up school and since then has developed her talents even more. This professional uses the latest techniques and the highest quality of beauty products to create a look that is incredibly long-lasting, which means there is no needs for permanent makeup options. You will certainly be impressed with the work of Jo Ann Salgado. What could be better for your wedding day than having a makeup artist in San Diego, CA come directly to you that has over two decades of experience? Paula Mayer is available to come to clients throughout the city or you can visit her studio in central San Diego. Whatever you choose is more convenient, it is a guarantee that she will exceed all of your expectations. 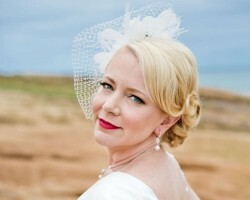 Paula is a true professional and she can create a range of looks that bring the best out of each bride she works with. You need look no further than Secret Salon for the highest quality of wedding hair and makeup services. Working closely with one of these experts means you will have access to some of the best advice in the country and a team that is trained to make you look absolutely stunning. In addition to providing amazing results Secret Salon use quality products and techniques to ensure your makeup is water-resistant and can withstand the whole wedding day and long into the night. Gina's passion for makeup artistry can be seen through her work gallery. Trained by some of the industry's top makeup artists and having experience working as a beauty consultant, she has acquired all the necessary skills to create flawless looks for brides. Client satisfaction is of high importance to her and she communicates thoroughly, listens and understands every bride in order to achieve the exact look the bride has in mind. 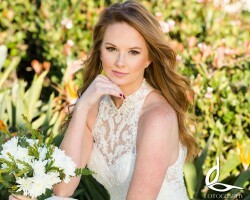 With one of the most impressive lists of clients of any San Diego makeup artists you know you can trust Gerine Coronado to provide stunning results for your wedding day. With a decade of experience Gerine is now one of the leading freelance makeup artists in California and she is ready to transform brides throughout the state. One of the best aspects about Beauty By Gerine is that she can duplicate any style that you love and all for amazingly affordable prices. 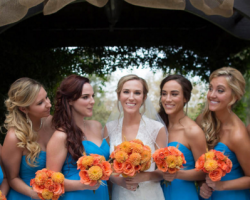 This select team of talented profession hairstylist and makeup artists have been dolling up Brides, Grooms and their Wedding Parties all over California. Their combined years of experience ensures that every bride will look and feel exactly as she has dreamed her entire life, and that look will last from the start of the ceremony to the last dance of the reception. With various packages to choose from and full salon services available, Call Artistry by Sabrina today to setup your Makeup and Hair Trial Session. From the reviews and gallery of previous clients you will immediately see just how varied the looks and styles that Lindsay Ann can create. This artist found a love of makeup in her teens and has been pursuing this passion ever since. After attending a great number of courses with famous makeup artists Lindsay now has the knowledge to bring out the best in any future-bride. No matter what look you are going for you can guarantee that this professional will exceed all of your expectations.